A few weeks ago, I posted on that most hallowed and exclusive of Regency haunts, Almack’s (click here to visit the post). On Wednesday evenings during the Regency (and beyond), only the most elite of the bon ton were admitted to the club for dancing, supper, and gaming—and just who might be elite enough to gain entrance was determined by a picky cabal of women. Called the Patronesses, these gals were high-born, wealthy, and accustomed to getting their own way. There were no more than seven on the committee at any one time, and their membership varied through the years. Captain Rees Howell Gronow, a handsome Welsh Grenadier Guardsman who was admitted to Almack’s in 1814 (probably for his dashing looks IMO), reported that five of the Patronesses were Lady Cowper, Lady Jersey, Lady Castlereagh, Lady Sefton, and Countess Lieven. Other sources include Mrs. Drummond-Burrell and Princess Estherhazy as Patronesses at this time, so I will, too. The daughter of an earl, Lady Castlereagh (Amelia Anne Hobart Stewart, Viscountess Castlereagh, 1772-1829) was a stickler for the rules at Almack's. Her husband, Viscount Castlereagh, was Foreign Secretary and leader of the House of Commons from 1812-1822. When he attended the second Congress of Vienna in 1814, she went along and entertained lavishly from her 22-room apartment, although many considered her parties dull and their hostess eccentric. She kept a zoo in the country and pampered her pet mastiffs, even when one attacked her husband. The couple had no children, but apparently cared for one another. Sadly, Lord Castlereagh committed suicide in 1822. Portraits of Lady Castlereagh exist, but none are in the public domain. Click here to see one. Countess Lieven (Dorothea Christornorva Benckendorff, 1785-1857), was born into Russian nobility in Riga, now Latvia. At fifteen, she entered into an arranged marriage to General Count Christopher Lieven, who became the Russian ambassador to Great Britain. Dorothea's social and political skills were put to good use in England, and she cultivated alliances--political and romantic--with several politicians, gaining as much influence as her husband. One might assume Dorothea's savvy came from a sweet personality, but she was (pardon me) a vindictive snob. She made enemies and she didn't forgive. Woe to the Regency chit of whom Countess Lieven disapproved. Mrs. Drummond-Burrell (Clementina Sarah Drummond Burrell, 1786-1865) was her Scottish father's sole heir, and when he died in 1800, she received his Perthshire estates and fortune. In 1807, she married the impoverished Honorable Peter Burrell (who later became Lord Willoughby de Eresby), and by royal license, the couple took the name of Drummond-Burrell, probably as part of her inheritance settlement. Peter was a dandy who spent Clementina's money freely, but she was known for being grand, herself. A stickler for following Society's rules, Clementina was powerful enough to raise or lower any Society hopeful. The below portrait is often erroneously ascribed as being hers, but it's actually her mother-in-law. No portrait of Clementina seems to exist. Every Mean Girl Club has a member prone to expressing sympathy for the less popular, and at Almack's, that would probably be Lady Sefton (Maria Margaret Craven Molyneux, 1769-1851). As the eldest member of the group in 1814, she had probably been a Patroness for a while. She’d married a good friend of the Prince Regent, the 2nd Earl of Sefton (aka Lord Dashalong because he loved riding so much), and his mother was possibly one of the founding members of Almack's. Maria's parents were notorious in their infidelities and her mother had been banished by her father, so Maria's high value for the observance of rules may have stemmed from her childhood. No portraits seem to exist of her as an adult, but a portrait of her as a small child (not in the public domain) may be found here. Princess Esterhazy (Maria Theresia, Prinzessin von Thurn und Taxis, 1794-1874) was the baby of the group. She was married to Prince Paul III Anton Esterhazy, the Austrian Ambassador to England. Our friend Countess Lieven said Maria Theresia was “small, round, black, animated, and somewhat spiteful” and demanded to be the center of attention. One wonders how large a grain of salt to take with much Princess Lieven says, however. Nevertheless, Maria Theresia was formal and a stickler for protocol and had little patience for what Regency readers might call encroaching mushrooms, aka social climbers. And there you have them! The gals you'd have to schmooze if you wanted to make it in Regency Society two hundred years ago. So which of the Lady Patronesses reminds you most of someone you knew in high school, or maybe of yourself? Susanne Dietze would not have been allowed into Almack's. She began writing love stories in high school, casting her friends in the starring roles. 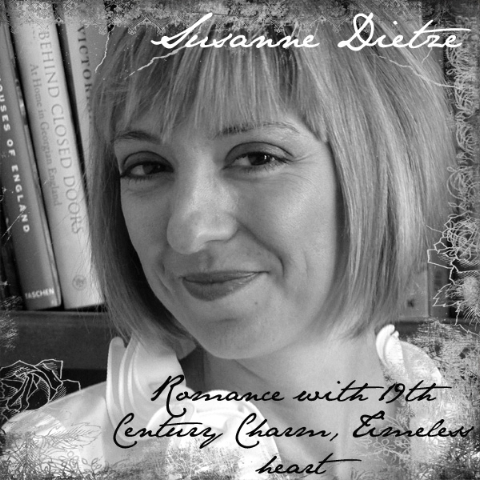 Today, she writes in the hope that her historical romances will encourage and entertain others to the glory of God. Married to a pastor and the mom of two, Susanne loves fancy-schmancy tea parties, travel, and curling up on the couch with a costume drama and a plate of nachos. She won first place in the Historical category of the 2011-2012 Phoenix Rattler, and her work has finaled in the Genesis, Gotcha!, and Touched By Love Contests. Susanne is represented by Tamela Hancock Murray of The Steve Laube Agency. You can visit her on her website, www.susannedietze.com. FIRST OF ALL, congrats to Susie on her semi-final placement in the 2013 ACFW contest. Secondly, Susie is really the last person to know about mean girls, so I know this was a lot of research! I've learned so much through this series. Wonderful! I see myself as Lady Castlereagh. A stickler for rules, eccentric, and wouldn't care if my dog bit my husband. And, as I hate to entertain, I'd say those parties might be dull indeed! Certainly one of those 22 rooms would be a writing cave. Well this was certainly fun to read. My thought as I read it was just what Deb said. Susie put a lot of work into this post. Wow. And wow. So my question might sound dumb but I don't read Regency so don't know: If you're writing Regency and your heroine goes to Almack's, can you include these ladies? If their pictures aren't in the public domain, it makes me wonder even more. Especially since they probably wouldn't be portrayed in the best light. Lady Willoughby looks sweet and I love her outfit. Especially the turban type hat. Did you notice the brooch she has pinned to the side of it? A BIG CONGRATULATIONS to our own Debra E. Marvin for her semi-final placement in the 2013 ACFW Genesis contest! Wahoo, Deb! Thanks for the congratulations, Deb. And I know you join me in congratulating the other semi-finalists as well as everyone who entered for putting their work out there. No easy thing. Deb = Lady Castlereagh. With that dog comment, you made me laugh while I was eating my yogurt. Oh dear! Lord Castlereagh has a minor walk on appearance in my WIP. Now I need to put his wife and dogs in there, too. Just for you, Deb. Suzie, that turban is great, isn't it? If your Regency heroine goes to Almack's, then she would have to have received the stamp of approval from one of the patronesses, yes. And the patronesses would definitely have been in attendance each week, so your heroine would need to acknowledge and thank them. Since the patronesses changed through time and I don't know who the patronesses were in say, 1819 when one of my stories is set, I choose to be vague about who they are in my story. But if I were setting a story in 1812, I would definitely mention one of them by name. Probably Lady Sefton, since she seems to have been a patroness for a while. Me neither, DeAnna! Unless by chance I'd been born to a super-rich lord and I had an astonishing dowry. Uh-huh. Nice job, Susie. I always get the Countess and the Princess mixed up. Of course, they probably would have never even acknowledged me, so I guess turn about is fair. High school indeed. I guess while fashions change, human nature doesn't. Suzie, back in the day when sweet, traditional Regencies were popular, Lady Jersey seemed to get a lot of cameo appearances. Was Lady Cowper (Emily Lamb) related to the infamous Charlotte Lamb of the same time period? As for getting the Countess and Princess mixed up, CJ...the Countess eventually became a Princess, so there you have it. They are easily mixed up. Ah, the infamous Caro Lamb. What a story. Anyway, yes, there is a significant connection between Lady Cowper and Caro Lamb! Lady C's oldest brother, William, was married to Caro. And Caro publicly preferred that dashing Lord Byron, although their relationship was toxic to the extreme. Devastation followed. Lady Jersey was the one who barred Caro Lamb from Almack's, however. Hmm, there's so much more to Caro Lamb, I may need to write it up in its own blog post! Write it, Susie. I'd like to read about Caro Lamb. Suzie, consider it done. Caro was very interesting. In a way, she was a celebrity stalker!